Our Christmas shoot rolled around quickly. Chris Bourke and his band of range setters went about setting a great range. He kept it close so as to avoid shooters being out in the heat to long. Mind you he did slip in a few sneaky ones! His last stand on range 2 was an “endangered species”. Now this involved 3 targets, 2 orange ones that crossed over each other and the third target being yellow going straight up the middle of them. Object – Don’t Hit The Yellow! If you did you lost all targets. This stand brought a lot of laughter and heckling – Great Fun! 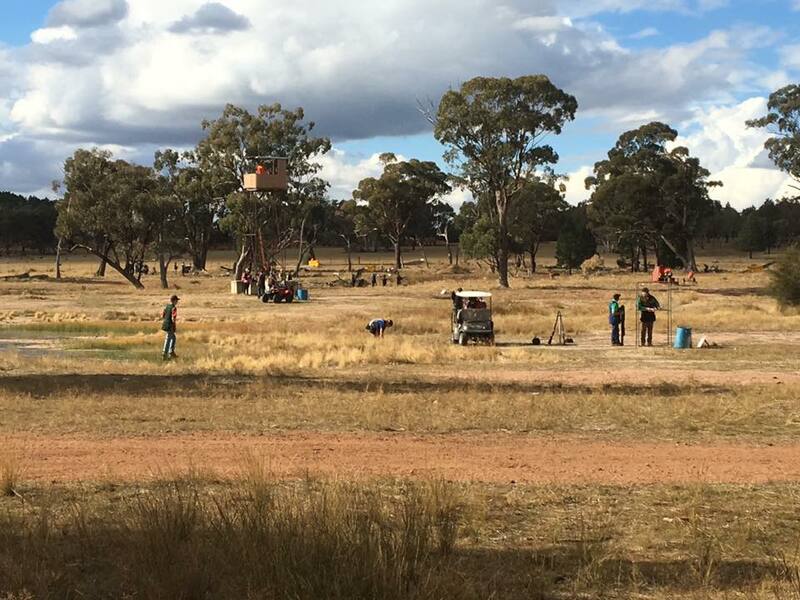 Wyanna Partnership – McGrath Foundation Ladies Pink Day Another fantastic shoot hosted by Dubbo field & Game and sponsors Wyanna Partnership of Gilgandra. Fines Jar was back in play with a fine chart attached to each score board, squads were able to fine their team mates for all reasons! – complaining about heckling, throwing shells (big no no), misc gun mount (luckily it was a fun day), swearing (big fine for that), not shooting chips, mean button pusher and apparently being “Awesome” got you fined as well. Aspect Property consultants Sunday 15th July Aspect Property Consultants shoot brought out a great day of shooting. Range setters Tony Corderoy, Denis Coaker, Rupert Backus, Neil Donaldson, John Corderoy masterminded some fantastic targets for the day. Peter Kay was given trap trouble duties for the set up. These guys even had their own catering supplied by Pedr and Jenny Corderoy – I’ve seen some of Jennys creations and I’m surprised the range got set – thought they would have been too busy eating! Guns & Game Magazine / Peter Kay Gunsmith Saturday 9th June The clouds opened up and let some rain fall down on the start of the Long Weekend and shooters did not whinge about it. Just thanking the gods for wet stuff coming from the skies. A couple of stands you seemed to of walked out 1-2 inches taller due to the mud sticking to the boots but I think that was used to some sort of advantage! High Gun Off The Gun was Chris Everett 2018 Handicap winner was Israel "Mr Uzi" Trapman which is fantastic for someone who hasnt been shooting long. AA Winners 1st - Mark Marshall 2nd Rod Carr A Winners 1st Peter Kay 2nd Dean Delaney 3rd John Collier B Winners 1st Tony Corderoy 2nd Ken Purvis 3rd Glen Bloink C Winners 1st Mo Ross (great to see a lady shooter take it out) 2nd Phil Cleal 3rd Charlie North (sub junior mixing it with the grade shooters) Sub juniors on the day were lucky to squad with Mark Marshall who the club had out from England to hold some coaching sessions. As a special of the day, the club gave a free coaching session with Mark to a lucky drawn shooter. Winner of this great opportunity was Ken Purvis The club would like to thank Luke Cross for his continued support of the club. Sunday 18th February brought out just under 50 shooters to the Duncan McGinness shoot. High Gun Winner - Stephen Cooper A grade - 1st Anthony Cahill 2nd Craig McPherson 3rd Stuart Cole B Grade - 1st Nick Ridley 2nd Lance North 3rd Ken Purvis C Grade - 1st Darrell Matthews 2nd Jarrod Nicholls 3rd Luke Tomlin Seniors - 1st Peter Kay 2nd Kevin Haskin 3rd Tony Monk Veterans - 1st John Sidoti 2nd Laurie Redfern 3rd Denis Coaker Master - 1st Les Townsend 2nd Bob Richardson 3rd David Rourke Ladies - 1st Mel Phillips 2nd Gabby Kirk 3rd Amanda Madsen Sub Juniors - 1st Charlie North 2nd Aliza Purvis Biggest thank you goes to Duncan McGinness for his ongoing support of the club. Positive there were quite a few wagging tails! 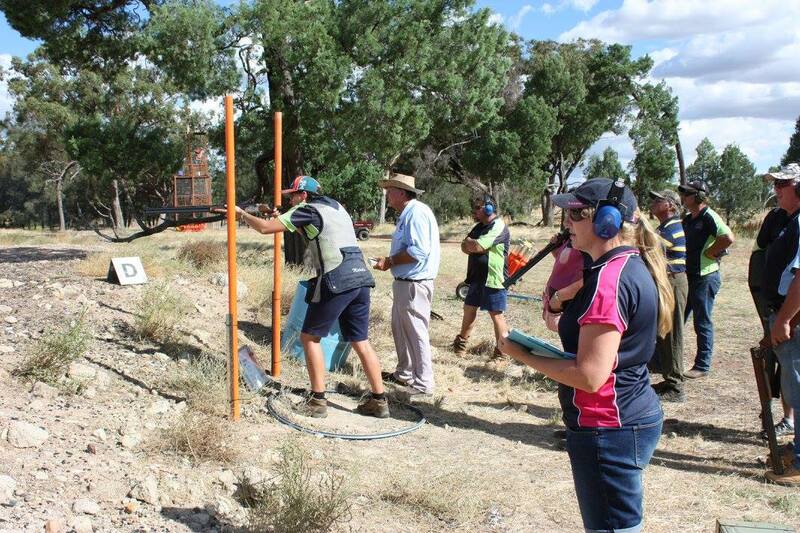 Menzies Pumps & Irrigation / Bourke Family Shoot was held Saturday 16th December. Although numbers were low, everyone attending had a great day. Horse and his range setters had a field day, hiding stands in amongst trees etc to catch the shade for majority of the day. Brilliant targets once again by Christopher the Cunning. They were set to make you think outside the square/circle/triangle :-) High Gun Winner - Alister Lyne on 82 A Grade - 1st Craig Mcpherson 2nd Luke Cross 3rd after a shoot off with Brett Hall was Stephen Cooper (which went down to the last target!) B Grade - 1st Rob Murray 2nd Rod Hotham 3rd Darren Guy C grade - 1st Lance North 2nd Luke Tomlin 3rd Stephen Woods Veterans 1st Peter Kay 2nd Milton Cartwright Supers 1st Laurie Redfern 2nd Les Townsend 3rd Keith Lyne Ladies 1st Helen Overton 2nd Michelle Hooper 3rd Mel Phillips Juniors 1st Eli Kelly Sub Juniors 1st Nicholas Lyne 2nd Ethan Kelly 3rd Tom Lyne Dubbo Field & Game wish to thank Menzies Pumps & Irrigation and the Bourke Family for their continued support. SINOCHEM SHOOT Sunday 17th September saw the return of the HAGGIS! Our friend from Scotland Hugo and his band of kilt wearing helpers set a fantastic range with a variety of great targets. Unfortunately there was only a small field of shooters who braved the beautiful sunny day to take on the mystical creature like upside down skipping target called the Haggis. Stephen Cooper took honours of High Gun overall Rupert Backus became Grouse King for the day And after a nail biting (no not really but sounds good) shoot off between an A Grade, Super Vet & Lady shooters for the title of 2017 Haggis Champion - Winner and Bragging Rights went to Chris Everett! A Grade Winners 1st Chris Everett, 2nd Craig Mcpherson, 3rd Rodney Carr B Grade Winners 1st Nick Ridley, 2nd Tony Corderoy, 3rd Ruper Backus C Grade Winners 1st Mark Hosking, 2nd Peter Tremble, 3rd Israel Trapman Veteran Winners 1st Peter Kay, 2nd Neil Donaldson Super Veteran Winners 1st John Sidoti, 2nd Denis Coaker, 3rd Les Townsend Ladies Winners 1st Mel Phillips, 2nd Amanda Madsen, 3rd Melanie Randell Thank you to Hugo and his helpers for a great range and all their hard work they put into it. To everyone that helped in the office either taking noms and payments,doing the scores etc. Big thank you to Stephen Smith for catering lunch - greatly appreciated! Dubbo Field and Game held the NSW State Selection #4 over the June long weekend as part of the 3 day Miroku Challenge. Sun was shining but unfortunately someone forgot to cancel the wind for the day! The layouts had been "tweaked & tightened" by PK and the setters from the previous day and along with the constant gusts of wind it was a whole new range! With some of the targets bringing quite a few shooters undone. The term "Think Outside the Box" I think became quote of the day! 88 Shooters took to the range to compete against the wind, targets and each other in order to take home those sought after sashes! Robert Hall proved himself as High Gun Winner with a score of 84. AA Grade - 1st Bart Brighenti; 2nd Stephen Payne; 3rd Jacob McKenzie A Grade - 1st Luke Cross; 2nd John Collier; 3rd Andrew Bell B Grade - 1st Stephen Smith; 2nd Gary Adams; 3rd John Dickey C Grade - 1st Paul Leonard; 2nd Akie Dovitsas; 3rd Ben Sweetland Veterans - 1st Peter Kay; 2nd Rodney Carr; 3rd Milton Cartwright Super Veterans - 1st Alec Ceccato; 2nd Ross Christian(+17); 3rd Laurie Redfern(+16) after a very intense shootoff between 2 great shooters Ladies - 1st Helen Overton; 2nd Karen Buys; 3rd Michelle Hooper Juniors - 1st Jack Roth; 2nd Tom McGrath; 3rd Oscar Mower Sub Juniors - 1st Nicholas Brighenti; 2nd Tayla Roth; 3rd Eli Kelly (after a shoot off with his own brother! ) Sub Junior results are taken over the first 50 The Adrian Hayes trophy was taken out by Sydney with the score of 259.